I live in New York City (Staten Island, to be exact). After learning about the zero waste community, I've become incredibly conscious of what I throw out and recycle and have looked for active ways to reduce waste in my home. I'm not completely zero waste (and in truth, I don't think anyone could be), but I'm way more informed. Thing is, everyone tends to believe recycling is the answer to waste-related problems. I think it is helpful (and better than sending something to a landfill), but it's certainly not the answer. It's good to know what you can, and cannot recycle because it will help you make more informed choices when you buy a product. For example, thanks to my own research, I now know squeezable tubes are not recyclable, so I will simply stop buying them (because I refuse to send them to a landfill). The same is true for everything else that's non-recyclable: I will stop buying them, and you should too. Even the things I can recycle I will do my best to cut back on, just because an item can only be recycled so many times (at least in terms of plastic). That said, it is very good to know your state's recycling rules so you don't put anything in the wrong bin (and mess up the recycling process all together). And if you don't live in NYC, that's okay too. I hope this guide inspires you to Google your state's own recycling laws. You may be surprised at what you find. Note: This information was sourced from nyc.gov's zero waste page and website. For more information, head to their site. Important note: Empty and rinse containers before recycling. Effective April 1, 2015, you can be fined $100 for placing electronics, such as computers and TVs, at the curb for disposal. See recycling options below. UPDATE: A pilot program provides curbside collection of electronics for Staten Island residents, by appointment. Fax machines, document scanners, and printers that are meant for use with a computer and weigh less than 100 lbs. Loose cables, cameras, GPS devices, and microwaves. Note: Items made of mostly metal or rigid plastic can be recycled with other metal/glass/plastic items. See options for rechargeable batteries and cell phones. It is illegal to discard a car battery in the garbage or recycling or on the street. Auto batteries can be recycled at service stations or auto supply stores that sell them, or take to household special waste drop-off site or upcoming DSNY SAFE disposal event. Illegal to discard in garbage or recycling if less than 25 lbs. Recycle through a retailer or manufacturer take-back program or take to household special waste drop-off site or upcoming DSNY SAFE disposal event. Discard alkaline batteries in the garbage (they aren't hazardous since they no longer contain mercury) or take to household special waste drop-off site or upcoming DSNY SAFE disposal event. Illegal to discard with garbage or recycling. 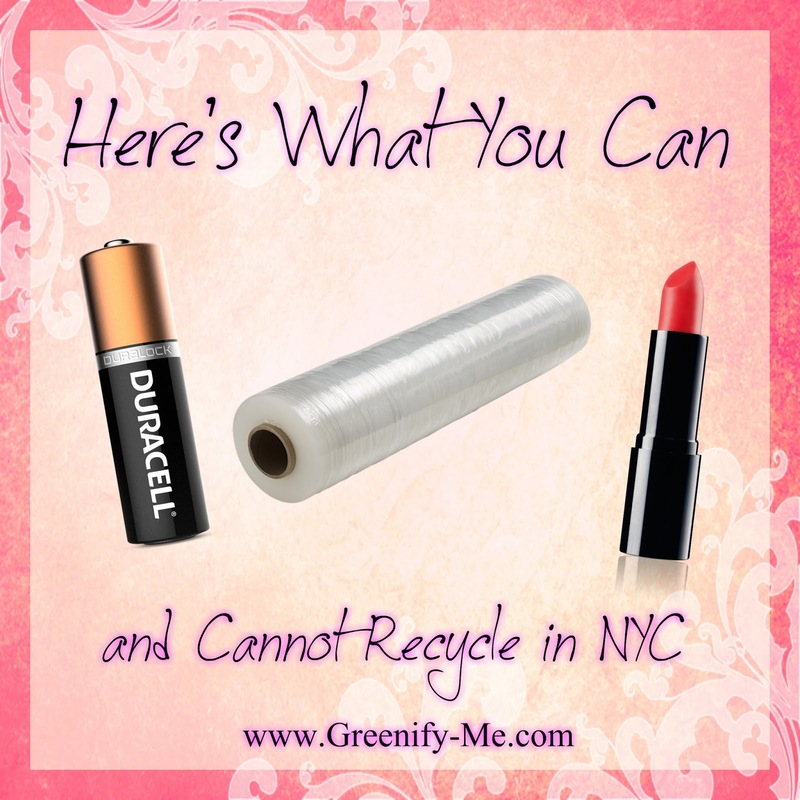 Stores in NY State that sell rechargeable batteries or products that contain them (with the exception of small food stores) must accept up to ten batteries of the same shape and size that they sell or take to household special waste drop-off site or upcoming DSNY SAFE disposal event. Individually bag batteries or tape terminals prior to dropping off. Recycle at a jewelry store, watch repair shop, or camera store. Otherwise, discard as garbage or take to a household special waste drop-off site or upcoming DSNY SAFE disposal event (individually bag batteries or tape terminals before dropping off). Donate or sell if in good condition. Otherwise, bring item to any store that sells this product so rechargeable battery can be properly discarded. NY State's Rechargeable Battery mandates that stores that sell rechargeable batteries (or products containing rechargeable batteries) must take back up to ten batteries of the same shape and size as they sell, free of charge. Recycle empty metal, glass, or rigid plastic containers. Please note: Cosmetics in plastic tubes are not recyclable. Items made of materials other than metal, glass, or rigid plastic can be placed in your regular garbage. Contains minimal amounts of mercury. The EPA recommends as a best practice that you air out the room with a window or door; collect materials with cardboard, tape, or wet paper; and place into a sealable container. Turn off air conditioning or heating unit if possible. Can be taken to upcoming DSNY SAFE disposal events. Can also be legally discarded in garbage, but double bag for safety. Contains minimal amount of mercury. Take back to retailer that accepts CFLs, or to household special waste drop-off site or upcoming DSNY SAFE disposal event. Can legally discard in garbage, but double bag for safety. Double bag for safety and discard as garbage on regular collection day(s). As you can see, there are loads of regulations on what can and cannot be recycled in NYC. I would suggest using this as a guide and doing your own research on it. Personally, I'm going to avoid buying anything I cannot recycle and limit purchasing even what it says I can recycle. This way, I will avoid sending nearly as much to a landfill. That, and I can invest in items that I won't need to recycle after one single use or two. After all, the best items are the ones you can keep for years without wear and tear. Plastic items certainly don't last for years (and I'd rather not put my money towards the creation of new plastic - all the plastic that was ever created is still on this planet, after all! We don't need more of it). And remember, if you're not a NYC resident, Google your state's recycling regulations so you can be an informed citizen too. carton box really helpful for packaging.